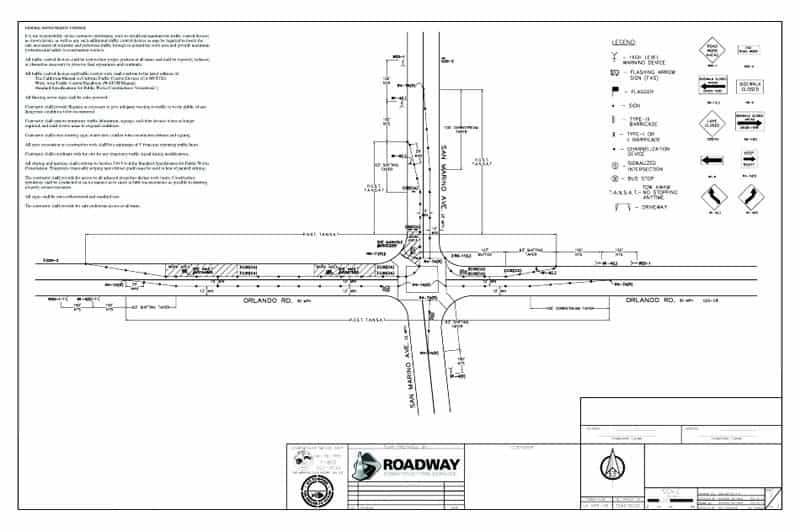 RCS provides temporary traffic control plans by certified traffic control design specialists. Traffic control planning requires forethought. Traffic Control Plans play an important role in providing safe and efficient traffic flow. Interruptions in normal flow are necessary for temporary traffic control operations. The temporary traffic control zone includes the entire section of roadway between the first advance warning sign through the last traffic control device. Most temporary traffic control zones can be divided into four areas: advance warning area, the transition area, the activity area, and the termination area. All of Roadway’s temporary traffic control plans are engineered to be site specific showing all current conditions, drawn to scale, and in accordance with the most recent Federal & State guidelines, and the requirements of the responsible Agency. Roadway is committed to using all new and available technology to produce the traffic control plans in the safest and most efficient manner possible to assist with completing your project, the Roadway way, on-time, on budget, safely.